Let’s explore which attributes affect the outcome of a battle. HP means how much damage a hero can take, until the hero dies. The higher the HP, the longer the hero survives. High HP heroes can be compared to tanks and are usually seen in the front row of your team. INT is used for buffs, debuffs, healing, and damage. Items like Musket, Book, or Scroll make use of INT in various ways. High INT heroes can be compared to Mages / Wizards / Druids and can be used in various of ways. They’re suitable as healers, buff / debuffers, and also as damage dealers. Agility determines how often your hero attacks, which has been explained in our previous post. In short: High AGI means the hero’s Active Skills get used more often. High AGI heroes can be compared to Assassins / High DPS / High Mana Mages and are a crucial part in any team because of their high frequency of Active Skills. Napoleon is a high INT and high AGI hero. Additionally, his passive deals 150% (!!) of his INT to the forefront enemy at a 25% chance every time he used an Active Skill. That’s another reason to equip him with INT items. You could get very creative in how to utilize Napoleon in a team of three. Do you make a backline healer out of him, since he has high INT and AGI? 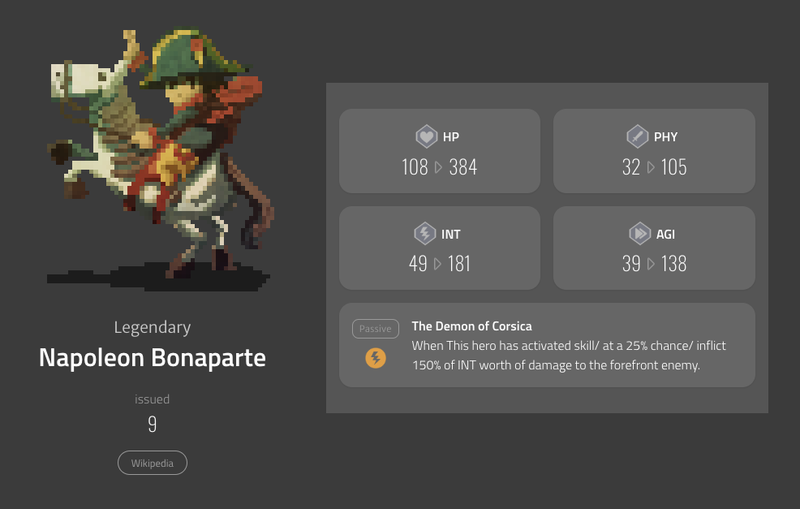 Or do you build him into an INT damage dealer, which synergizes with his passive? If you end your training now — if you choose the quick and easy path as Vader did — you will become an agent of evil. Okay, one step back. Let’s keep things simple and start with the basics: Which attributes scale with my Active Skills and Passive skills? How do they affect the damage that gets dealt? What about healing? This post covers all that, while our next post covers how to use Napoleon Bonaparte in a team properly. Be patient young crypto gamer. Are you ready for some math? Don’t worry, it’s actually quite simple and will make you a better player. There’s no need to memorize everything in this section. My main goal is to give you a rough idea of how damage and healing numbers are calculated and which attributes affect them. Physical damage is dealt through Active or Passive Skills, for example: Red Strike’s Inflict 40–60% of PHY worth of damage to the forefront enemy. 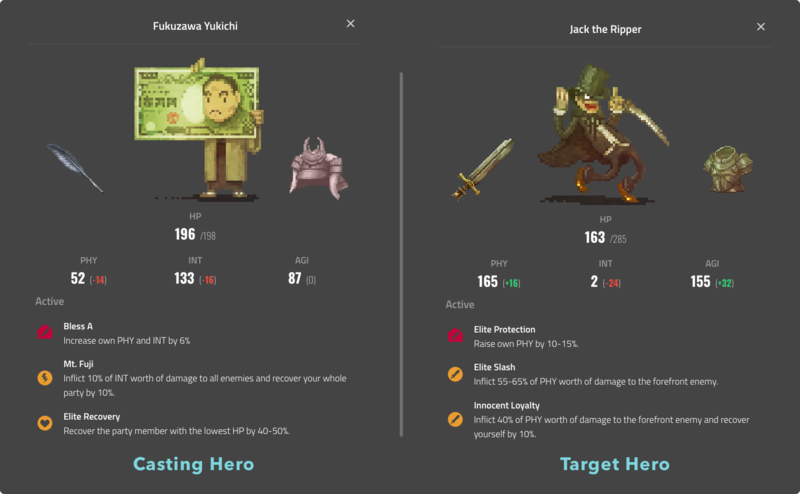 There are three variables that decide how much damage is dealt to the opponent: Attacker’s PHY, Item Effect, and Defender’s PHY. Defender’s PHY decides the Damage Reduction Rate, which is capped at 40%. In other words: the Attacker’s damage is at maximum reduced by 40%. 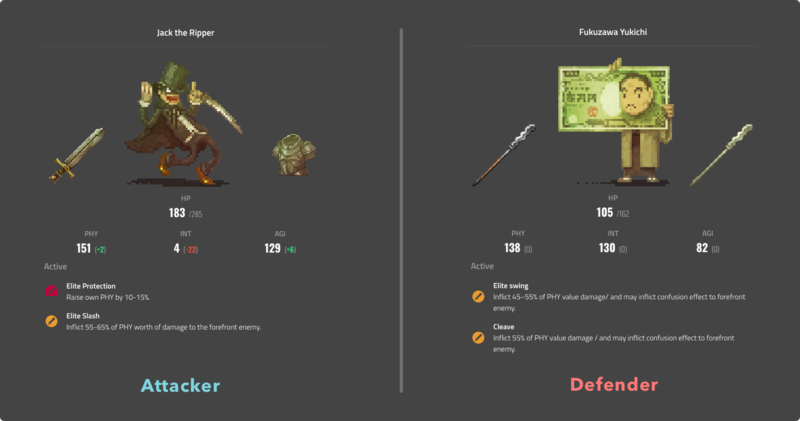 Three variables decide how much damage is dealt to the opponent: Attacker’s INT, Item Effect, and Defender’s INT. Defender’s INT decides the Damage Reduction Rate, which is also capped at 40%. In other words: the damage is at maximum reduced by 40%. We will skip an example at this time, since it’s exactly the same mechanism as with PHY damage. But we have another example for you, so don’t you worry. I applaud you for getting this far, good job! This knowledge is enough to get you through the lower nodes and get some wins in the PVP duels under your belt. If you are a competitive player, like I am, the next step is to learn about team compositions. The combination of heroes and extensions play a crucial role in how you can fine-tune your team, so don’t stop here. We need your help: We want to showcase some teams of our player community in our next post. If you want to help out, check out our subreddit and post your composition along with a short explanation. The community will appreciate your wisdom! Join the My Crypto Heroes Discord Server!